Oil control can be a problem with high performance and high revving Subaru engines. High crankcase pressure along with the horizontal engine platform restricts rapid oil return from the cylinder heads to the oil pan. Pressure builds in the heads and crankcase causing massive blow by and power loss. 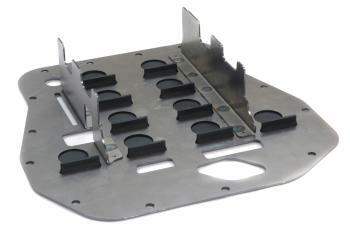 The Cosworth Subaru Oil Pan Baffle has been engineered with diverters to control oil returning from the cylinder heads to the pan directing it away from the crankshaft. Additionally, one-way valves prevent oil from reentering the upper crankcase chamber thereby limiting blow by and preventing oil starvation during hard driving. Manufactured from stainless steel and installs easily between the block and oil pan on both EJ20/EJ25 series engines. Use with our High Volume Oil pan for maximum oil control.